According to family tradition, Charlie may have been married as many as six times (or more) after his marriage to Edna Stanley. A marriage license was issued on 27 August 1921 in DeKalb County to Charlie Clayborn and Mandie Vanattie. [Tennessee, State Marriage Index, 1780-2002, accessed 6 March 2015 via Ancestry.com, citing p. 128, DeKalb, Tennessee, United States, Tennessee State Library and Archives, Nashville, Tennessee.] Not long later he married to Cora Sandlin on 12 November 1922 in DeKalb County, Tennessee. [Tennessee, State Marriage Index, 1780-2002, accessed 6 March 2015 via Ancestry.com, citing p. 234, DeKalb, Tennessee, United States, Tennessee State Library and Archives, Nashville, Tennessee.] He was married to Cora through at least 1930 as the U.S. Census for 1930 – DeKalb County, Tennessee – District 19 lists Charlie Clayborn (age 43) living with Cora (age 29) and Clay Edward Clayborn, age 13 (son by Edna Stanley) also in the household. [1930 United States Census, DeKalb County, Tennessee, District 19; Household 29; Dwelling 30; pg. 245.] He and Cora divorced. Matilda Mai Clayborn (called “Tildie”) was born on 23 January 1907 in DeKalb County, Tennessee. [This information is based on Matilda’s tombstone in Salem Cemetery in Liberty, Tennessee.] She married William Floyd Martin on 8 April 1922 in DeKalb County, Tennessee. [William Martin was born on 23 September 1902.] Together they had three sons: Dawes E. Martin, James Carmack Martin, and Jimmy McDonald Martin. William died on 28 May 1978 and is buried at Salem Cemetery, Liberty, Tennessee. [This information is based on William’s tombstone in Salem Cemetery in Liberty, Tennessee.] Matilda died in DeKalb County, Tennessee on 09 July 1987 and was buried in Salem Cemetery, Liberty, Tennessee. Dawes Evert Martin was born on 04 April 1925 in DeKalb County, Tennessee. [This information is based on his tombstone in Salem Cemetery and his obituary in the Smithville Review (10 October 2001).] He married on 31 March 1945 to Mary Evelyn Parkerson (born on 27 July 1928) in DeKalb County, Tennessee. Dawes worked at Avco in Nashville, Tennessee, for thirty-four years and was a veteran of World War II in the United States Army. Together Dawes and Mary Evelyn had three sons, listed below. [Dawes E. Martin Obituary, Smithville Review, 10 October 2001.] Mary died on 26 September 1999 and Dawes died on 5 October 2001 at the University Medical Center in Lebanon, Wilson County, Tennessee. He was buried at New Hope Cemetery near Alexandria, Tennessee. Ronnie Martin lived in Oklahoma City, Oklahoma, in 2001. Tommy Martin married a woman named Kathy and they lived in Lebanon, Tennessee, in 2001. Rick Martin married a woman named Debbie and they lived in Watertown, Tennessee, in 2001. Tim Martin was born on 10 December 1959. He married a woman named Faye and they lived in Smithville, Tennessee, in 2012. Greg Martin lived in Smithville, Tennessee, in 2012. Penny Martin lived in Smithville, Tennessee, in 2012. William Clay Clayborn (called “Bill”) was born on 5 June 1908 in DeKalb County, Tennessee. On 21 April 1929 he married Ella Orethia Malone (born on 14 June 1913). Bill was a farmer and lived in the Lower Helton Community just east of Alexandria, Tennessee. Together they had four children. William died on 4 October 1981 and Ella followed on 30 March 1997 in Alexandria in DeKalb County. They are buried at Mt. Zion Baptist Church Cemetery in Temperance Hall, DeKalb County, Tennessee. Bobby Kenneth Clayborn was born on 17 July 1953 in Lebanon, Wilson County, Tennessee. He married Shelia Arnold (born on 6 September 1954 in DeKalb County, Tennessee) on 12 May 1972 in DeKalb County. Together they had one child listed below. Brian Clayborn was born on 24 October 1976. He married Holly Butterball. Together they had one child, Shelby Clayborn, born on 17 February 2001 in Wilson County, Tennessee. This marriage ended in divorce. Betty Charissee Clayborn was born on 17 December 1958 in Lebanon, Wilson County, Tennessee. She married Joel Baker on 28 June 1979. Together they had two children, Joshua and Jessicca Baker, listed below. This marriage ended in divorce. Betty later married Kenneth W. Allen (born 16 October 1955, died 05 September 2009) on 2 February 1991. [Kenneth W. Allen Obituary, WJLE Radio Station, 7 September 2009.] Together they had twins, John Schyler and Taylor Charissee Allen, listed below. Joshua Baker was born in February 1980 in Wilson County, Tennessee. Jessica Baker (called “Jessie”) was born on 26 June 1981 in Wilson County, Tennessee. John Schyler Allen was born on 13 May 1992 in Lebanon, Wilson County, Tennessee. Taylor Charissee Allen was born on 13 May 1992 in Lebanon, Wilson County, Tennessee. William Lee Clayborn (called “Willie”) was born on 28 April 1967 in Lebanon, Wilson County, Tennessee. Jacqueine Lisa Clayborn (called “Lisa”) was born on 1 March 1961 in Lebanon, Wilson County, Tennessee. She married Wayne Douglas McKinney (born on 1 May 1962 in Carthage, Smith County, Tennessee) on 25 November 1983 in Lebanon. Together they had one son listed below. Lisa and Wayne divorced in 1999. She lived in Watertown, Tennessee, in 2015. Dustin McKinney was born on 27 May 1984 in Lebanon, Wilson County, Tennessee. He married Natalie Lewis (born 22 June 1992) on06 October 2012 in Red Boiling Springs, Macon County, Tennessee. Judy Ann Clayborn was born on 19 January 1943 in Alexandria, DeKalb County, Tennessee. She married Roy Hollis Slager (born 7 May 1938) on 12 September 1959. Together Judy and Roy Slager had one son, Dennis Slager, listed below. Roy and Judy resided in Alexandria. Roy was a longtime area businessman and farmer. He worked at Textron Industries from 1959 to 1971, operated the Liberty Service Station for two years, and then operated Alexandria Shop Easy from 1983 to 1990. He was also a DeKalb County Sheriff’s department employee from 1992 to 2001. Roy died on 26 April 2005. [Roy Slager Obituary, Smithville Review, 4 May 2005.] After Roy’s death Judy Clayborn ran an antiques store, Judy’s Antiques, located on Highway 70 in Alexandria. Dennis Slager was born on 19 August 1960 in Lebanon, Wilson County, Tennessee. He married Teresa McMillen (born on 23 August 1960 in Carthage, Smith County, Tennessee) on 13 May 1979 in DeKalb County, Tennessee. Together they had two children listed below. Holly Slager was born on 22 April 1981 in Lebanon, Wilson County, Tennessee. She married first to Cory Vickers. This marriage ended in divorce after a short period. She then married Alex Williams on 10 August 2010 in Alexandria, DeKalb County, Tennessee. Together they had one child, Preston Layne Williams, born on 30 July 2011 in Murfreesboro, Rutherford County, Tennessee. Jon D. Slager was born on 27 January 1985 in Lebanon, Wilson County, Tennessee. He attended and graduated from DeKalb County High School in 2003, Middle Tennessee State University in 2008, and Nashville School of Law in 2012. He subsequently passed the Tennessee bar and practiced law in Smithville, Tennessee, in 2015. Daisy Bell Clayborn was born on 1 March 1911 in DeKalb County, Tennessee. She married John Hobart Martin (called “Hobart”)on 20 August 1927 in DeKalb County, Tennessee with E. H. Hass, J.P. officiating. [John Martin was born on 21 September 1910. See John and Daisy Martin’s tombstones in Snow Hill Baptist Church Cemetery located near Smithville, Tennessee. John was a brother to William Floyd Martin, husband of Matilda Mai “Tildie” Clayborn Martin.] Together they had fifteen children and resided in District 11 – Lower Helton area of DeKalb County, Tennessee in 1940. [Research from DeKalb County, Tennessee, Historian Thomas Gray Webb.] John died on 2 September 1953. Daisy would follow in death on 15 January 2001 and be buried at Snow Hill Baptist Church Cemetery near Smithville, Tennessee. John McKinley Martin (called “Johnnie”) was born in DeKalb County, Tennessee. Jimmy Lurda Martin (female) was born on 5 March 1927 in DeKalb County, Tennessee. She married on 27 September 1952 in Smith County, Tennessee, to Ervin L. Beacham (1 November 1916 – 20 December 1983). [Tennessee, State Marriage Index, 1780-2002, accessed 1 February 2015, via Ancestry.com.] He was a private in the U.S. Army during World War II. Jimmy, a homemaker and a Baptist, died on 2 September 2011 at DeKalb Community Hospital and was buried in Whorton Springs Cemetery near Smithville, Tennessee.[Ms. Jimmy Lurda Beacham Obituary, WJLE Radio Station, 3 September 2011.] Together this couple had eight children. Mary Ann Beacham was born on 22 February 1955 in DeKalb County, Tennessee. She married Buford Davidson on 13 July 1972 in DeKalb County, Tennessee. Together they had five children, detailed below. She would later marry Robin Wray on 6 April 1982 in DeKalb County. Mary passed away on 29 April 2010 in Chattanooga, Hamilton County, Tennessee, and was buried at Mt. View Cemetery in McMinnville, Tennessee. Judy Beacham lived in Pennsylvania in 2012. Vicky Beacham lived in Dowelltown, Tennessee in 2011. Barbara Beacham lived in Dowelltown, Tennessee in 2011. Ervin Raymon Beacham lived in Smithville, Tennessee, in 2011. He was a nurseryman for Gutherie Nursery in McMinnville, Tennessee, and was of the Baptist faith. He was tragically murdered at his home in Smithville on 7 August 2012. David Howard Dixon was convicted of the murder in December 2013 and sentenced to thirty-five years in prison. Jessie Beacham married Bessie Janelle Narramore (called “Jan”) on 5 December 1981 in Warren County, Tennessee, and lived in Rock Island, Warren County, Tennessee in 2012. Jimmy Beacham married Cindy and lived in McMinnville, Warren County, Tennessee in 2012. Mark Beacham married Michelle Renee Gilbert on 7 March 1985 in Benton County, Tennessee, and lived in Dowelltown, Tennessee in 2012. Gail Hale married Melvin Legon. Lois Hale married John Lashley. Rosa Lee Martin was born in DeKalb County, Tennessee, and died around the age of two or three years old. Jimmy Martin resided in Smithville, Tennessee, in 1998. David Martin resided in Smithville, Tennessee, in 1998. Thelma Lee Martin was born in DeKalb County, Tennessee, and died around the age of two or three years old. Lenwood Ferrell was married to Joyce and resided in DeKalb County, Tennessee, in 2013. Shirley Ferrell resided in Woodbury, Cannon County, Tennessee, in 2013. Doris married a man with the last name of McCormick and resided in McMinnville, Tennessee, in 2009. Donna married a man with last name of Fulton and resided in Jamestown, Tennessee, in 2009. Gail married a man with the last name of Perryman and resided in the Cedar Grove Community of Bedford County, Tennessee, in 2009. Douglas Lynn Martin married Jama Charlene Carter on 22 November 1986 in Cannon County, Tennessee. Together they had three children: (1) Cody Martin, (2) Martha Martin, and (3) Laura Martin. This marriage ended in divorce. Douglas resided in Smithville, Tennessee, in 2015. Donald Wayne Martin married Patricia J. Marr (called “Patti”) on 8 January 1983 in DeKalb County, Tennessee. Lisa K. Martin lived in Phoenix, Arizona, in 2013. Frank Ira Martin was born on 2 November 1944 in DeKalb County, Tennessee. He died of viral pneumonia on 17 July 1958 and was buried at Snow Hill Baptist Church Cemetery near Smithville, Tennessee. Carolyn Martin was born in DeKalb County, Tennessee. She married first to Jimmy Caldwell on 15 June 1964 in Warren County, Tennessee. She married second to Jim Sanders. This couple resided in Henderson, Texas, in 2014. James Hobart Martin was born on 26 February 1948 in DeKalb County, Tennessee. He married first to Donna Marie Page on 17 May 1968 in DeKalb County, Tennessee. He married second to Sennie Evelyn Taylor on 1 January 1987 in White County, Tennessee. James worked for the DeKalb County School System for many years in the Maintenance Department. Minnie Bell Martin was born on 24 November 1949 in DeKalb County, Tennessee. She married Leslie Carl Taylor (called “Windy”) (8 February 1930 – 31 July 1998) on 26 June 1970. Together this couple had four children, listed below, and resided in Warren County, Tennessee, in 1986. Minnie Bell Martin Taylor died in Nashville, Davidson County, Tennessee, after an extended illness on 13 February 1986 and was buried at Unity Cemetery in Warren County, Tennessee. Peggy Sue Martin was born in DeKalb County, Tennessee. She married James Harold Smith (called “Buddy”) on 29 June 1970 in Cannon County, Tennessee. This couple resided in Nashville, Davidson County, in 2014. Ginger L. Martin was born in DeKalb County, Tennessee. She married George Steinbeck on 7 June 1970 in DeKalb County. This couple resided in Smithville, Tennessee, in 2014. 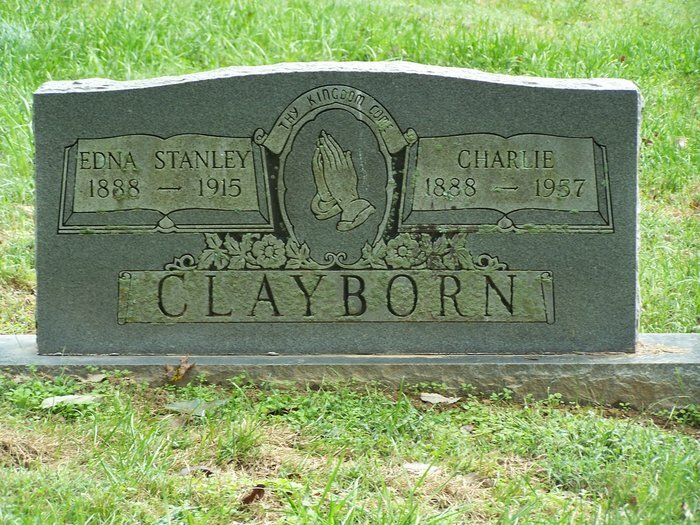 Clay Edward Clayborn (called “Ed”) was born on 18 March 1917. [Social Security Death Index, Tennessee (Issue Date: 1954).] He married Loretta Parkerson on 5 December 1936. [Loretta Parkerson was born on 5 March 1920.] Together they had three children, listed below. 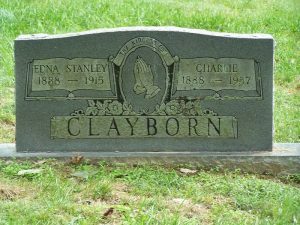 Clay died on 26 December 1984 and Loretta followed in death on 15 March 1995. Charles Walter Clayborn was born on 24 June 1940. [Correspondence with William Freddy Curtis in January 2015.] He married Betty Lou Hale on 20 June 1959 in DeKalb County, Tennessee. [Betty Hale was born on 13 July 1940 in DeKalb County, Tennessee. For marriage records see Tennessee State Marriage Index, 1780-2002, accessed 25 January 2015 through Ancestry.com.] Together they had four children and lived in Alexandria, Tennessee, all of their lives. Connie Jo Clayborn was born on 27 March 1962 at McFarland Hospital in Lebanon, Wilson County, Tennessee. She married Johnny Otto Florida on 3 March 1983 in Cannon County, Tennessee. [Johnny Florida was born on 17 September 1963. For marriage records see Tennessee State Marriage Index, 1780-2002, accessed 25 January 2015 through Ancestry.com.] Together they had one child, Jennifer Elaine Florida, born on 19 September 1983 in Nashville, Tennessee. Edward Warren Clayborn (called “Eddie”) was born on 9 April 1964 at McFarland Hospital in Lebanon, Wilson County, Tennessee. He married Jamie Lynn Ward on 30 January 1983 in Smith County, Tennessee. [Jamie Ward was born on 23 May 1960. For marriage records see Tennessee, State Marriage Index, 1780-2002, accessed 25 January 2015 through Ancestry.com.] Together they had two children. James Edward Clayborn was born on 29 January 1985 at McFarland Hospital in Lebanon, Wilson County, Tennessee. He married Heidi Lynn Montalbo on 27 November 2011 in DeKalb County, Tennessee. Stephanie Brooke Clayborn was born on 29 March 1987 McFarland Hospital in Lebanon, Wilson County, Tennessee. She married Cyrus Edward Shores Jr. on 10 June 2006 in Smith County, Tennessee. Tommy Darrell Clayborn was born on 4 September 1969 at McFarland Hospital in Lebanon, Wilson County, Tennessee. He married Maria Etta Ashford on 21 January 1989 in DeKalb County, Tennessee. [Tennessee, State Marriage Index, 1780-2002, accessed 25 January 2015 through Ancestry.com.] Together they had two children. Heather Clayborn was born on 2 September 1989 in DeKalb County, Tennessee. She married Jesse Janecke on 23 July 2011 in DeKalb County, Tennesse. Thomas Clayborn was born on 30 June 1992 in Wilson County, Tennessee. Edna Joyce Clayborn (called “Joyce”) was born on 21 February 1951 in DeKalb County, Tennessee. William Michael Clayborn (called “Mike”) was born on 16 July 1952 in DeKalb County, Tennessee. Montie Lee Clayborn was born to Charlie Clayborn and Laura Elizabeth Wilkerson on 8 December 1942 in Sparta, White County, Tennessee. Her father, Charlie Clayborn married Laura Elizabeth Wilkerson on 30 January 1941 in White County. [“Tennessee, State Marriage Index, 1780-2002,” Tennessee State Library and Archives, Nashville, Tennessee, accessed 6 March 2015 via Ancestry.com.] This marriage ended in divorce prior to 1947, as Laura Elizabeth Wilkerson would later marry Claudie Virgil Baker on 18 April 1947 in Walker County, Georgia. [Walker County Marriage Records, accessed 8 March 2015 via http://www.usgwarchives.net/marriages/georgia/walker.htm.] Montie Lee Clayborn married on 24 June 1962 to Curtis Wayne Winnett (born on 14 December 1942). This couple resided in Sparta in 1985. [Ed Clayborn Obituary, Smithville Review, 2 January 1985.] She died on 8 June 1990 in White County and was buried at Highland Cemetery in Sparta.